"It was a culture of 'no bad news' within this company that was at fault". Hastie Group CEO Bill Wild is quoted as saying in The Age . If you consider a multi layered organisation, imagine if Truth to Power is low at the 'lower' levels of the organisation. Imagine if it is also low at the middle levels of the organisation. Then imagine if it is low at the more senior levels of the organisation. Candor lies at the core of Truth to Power. This means that at all levels of an organisation people are encouraged to say when they believe is going on, understanding that there perspective is only part of the picture. But an important part none the less. This means that managers and leaders have to learn how to handle hearing things they don't like to hear, especially when the 'truth' might relate to an issue that the manager believed had been resolved some time ago. Managers also have to have the courage to speak with their colleagues when they see evidence that they are damaging Truth to Power through their lack of engagement with their direct reports. Saying, "Bob's always been like that, he never listens to his people" is not satisfactory. In fact it highlights managers accepting the unacceptable behaviour of their colleagues and the simple truth is that such behaviour can place everyones jobs at risk, including the managers themselves. Read this article here inside the OTM Academy. The use of email is still a main driver for miscommunication within the workplace. People simply rely too much on it for their communication, or rather they rely too much on it as the main channel for workplace communication. Given that up to 90% of the written word is interpreted by the recipient of the message, email is a risky channel of communication especially when the author of the message suspects that it has a high chance of being interpreted negatively. Yet people continue to press 'send'. And again and again and again. And they wonder why their workplace relationships suffer. And they wonder why performance suffers when negative energy is wasted on unnecessary miscommunication. Communicating any message by a single channel is risky business. And even riskier when the message has a high probability of being misinterpreted. Unless you are deliberately intending for someone to read a negative message from your email, then it is best to use multiple communication channels to send your message. A communication channel is a means through which a message is sent. It could be verbal, a text message, an email, a video, a presentation, an audio recording, a website, a blog - the list of possible channels is virtually limitless. When you have a potentially difficult issue to convey speak to the person or people to whom you wish to convey your message first. This can be in person or at least over the phone. It is after you have conveyed your message via a verbal format that you should then follow up with an email, simply highlighting the key aspects of your verbal conversation. This simple technique of using multiple channels to convey your message will significantly decrease the chances that the recipient of your message will misinterpret your intentions. Business relationships won't suffer and performance won't be reduced. A little care and forethought goes a long way. What is your experience of using multiple channels to more effectively communicate your messages in the workplace? What Really Matters! 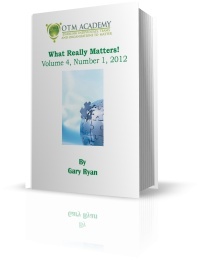 Volume 4, Number 1, 2012 complimentary edition released. This complimentary ebook is for Senior & Developing Leaders who share our view that organisational success is created through enabling people to be the best they can be, was created from a selection of articles published on the OTM Academy from January 1st 2012 through to April 30th 2012.